From the computer and straight to the product – such is the current goal of modern manufacturing, also known as the Industry 4.0. Over the course of the next decade this is set to shape the global economy on a sustainable basis, and the Magdeburg start-up m4p is prepared for the future. World-beating companies such as Apple and Google started off small – in a garage. Right now, one hopeful “garage company” with a feel for future markets is m4p, which stands for “metals for printing.” Established in October 2015 by Dr Eng. Andreas Pelz in Magdeburg as a private company (GmbH), the company name also represents its purpose: m4p focuses on the additive manufacturing of sophisticated metal tools as part of the Industry 4.0 technology. Additive 3D manufacturing is forward-looking because it is able to create high quality products with limited resources on a more environmentally friendly basis than before. In this context, additive manufacturing technologies can help reduce product development times because products designed by computer – such as 3D printing – can be transferred into reality. At the end of the 1990s and start of the 2000s, the key advantages were in the area of the manufacturing of models and prototypes. According to a VID status report dating from 2014, the advances in the area of 3D printer technology now enable the full small series manufacturing of components at competitive prices, especially in the aviation and aerospace industries. Dr Eng. Pelz – the director of m4p – is convinced that over the course of the decades to come, 3D printer technologies will experience major growth in many fields – from the automotive industry, to tool manufacturing, to medical technology, to environmental technology. The Magdeburg-based engineer is far from alone with these expectations. The acclaimed management consulting firm Roland Berger estimates the global market for additive manufacturing will total 7.7 billion Euros by 2023. Additive manufacturing is an important part of the Industry 4.0 initiative. With additive manufacturing, a three dimensional component (3D-CAD data record) created in the computer is implemented directly in the form of a genuine component. The item is then created in thin layers with the use of a 3D printer. A variety of different materials can be used as the base materials. These include plastics as well as metals, ceramics and plastics. Research into the process-capable materials is currently advancing at high speed. The company m4p wants to highlight the many alternatives of 3D printing with companies in Saxony-Anhalt and from other parts of the EU. The advantages of this process are the omitting and/or the reduction of erosive production methods, such as drilling, turning and milling, and the omitting of samples and/or formed parts, during moulding, for example. 3D polymeric printers are now on the market. The base materials are only stable and resilient to a limited degree, however. Higher levels of resilience and strength, and therefore industrial relevance, are achieved by metallic components which can also be created in the additive manufacturing process. This process is made possible with different energy sources on the basis of laser or electron beams which are now available for use in industrial production. In this respect, microscopic metal particles (metal powders) of selected grain sizes that are round in shape and have the appropriate material properties are used for the additive production of components and tools. With metallic 3D printing components expand on a step-by-step basis through the melting, application and hardening of metal powder materials. Engineers differentiate between differing processes in the field of 3D printing techniques. The industrial applications used the most often are selective laser melting (SLM) and electron beam melting (EBM). The CAD model is created by the computer in layers and is developed one layer at a time. The 3D printer consolidates the shape at the locations that should subsequently consist of stable material. At the moment, industrial companies from the medical and aviation industries are making the most frequent use of cost and resource saving 3D printing. Until now, relatively few SME companies have taken up the possibilities that this technology offers and the potential savings in development times, assembly- and production costs. This is where Dr Pelz from m4p envisages an opportunity to exist. The company’s founder completed his university studies and doctorate in the subject of mechanical engineering at Magdeburg University in 2004. He then spent a decade working as an engineer at a powder metallurgical company. That was just the start, however. In 2015, Dr Pelz founded his own company which focuses on new, additive manufacturing technologies. The key focus of m4p is the development, refinement and sale of metal powders, from aluminium to zinc. “We try to respond to our customers’ requirements surrounding the metal powder with regards to solidity, hardness and corrosion resistance, etc., and want to convince with individual solutions,” explains the director of m4p. Additive assembly speeds have developed quickly over the last two decades. This is due to the contribution made by improvements in computer and laser technology as well as the software used for the additive manufacturing. With the additive technology, savings of up to 60 percent are sometimes possible in terms of materials and weight levels. Applications in areas including metal implants in the field of biomedicine are currently envisaged for the future. 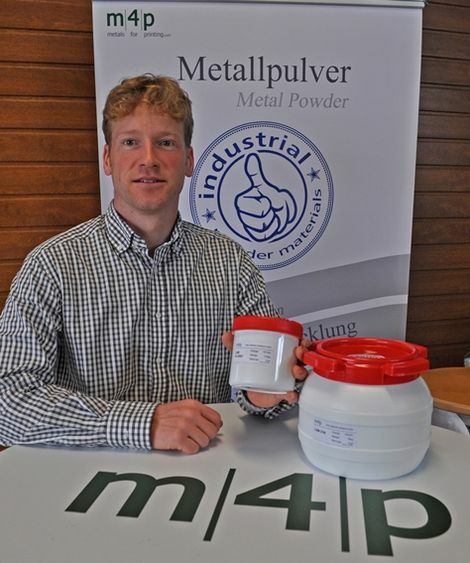 The Magdeburg start-up company m4p envisages an opportunity for the technology to be widely used by industrial companies in the near future, at the request of whom m4p is able to customise and supply metal powders to order. In October, m4p will begin operating a filtration system which is able to realise targeted metal powder grain sizes with the use of inert gas. The Magdeburg start-up is currently focusing on customers in Germany and to an increasing extent, the rest of Europe. It received a start-up grant from the Investment Bank of Saxony-Anhalt and is also supported by the federal state with the completion of feasibility studies on the use of various powder materials in additive manufacturing and with appearances at trade shows, such as the Rapidtech 2016 in Erfurt and the FormNext in Frankfurt. Image caption: Dr Eng. Andreas Pelz founded the company m4p in 2015. The company develops, refines and sells metal powders for additive manufacturing processes. Dr.-Ing. Andreas Pelz foundet the business m4p in 2015. He refines and markets medal powders for additive manufacturing processes.